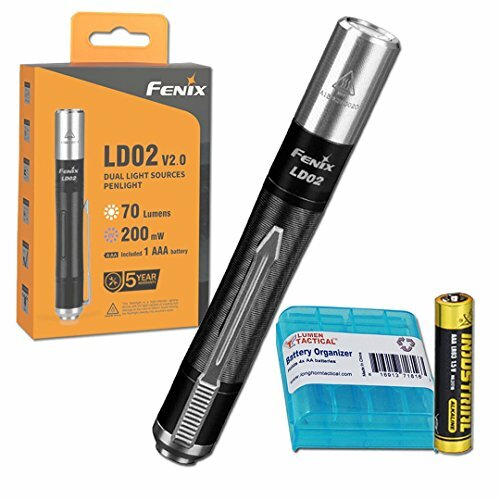 The Fenix LD02 V2.0 gives this popular penlight the upgrade treatment, now featuring a UV output for fluorescent detection. By adding a 200mW UV LED, the LD02 V2.0 can be used for identification and currency verification, fluid and grease detection, scorpion detection and plenty more. Fenix also swapped out the primary LED for a CREE XQ-E LED in the LD02 with one that has a CRI rating of 90. The result is a warm, sunlight-like beam that can render colors beautifully. Measuring 3.6" long and weighing less than an ounce (without battery), the LD02 V2.0 is ideal for everyday carry and frequent usage. A stainless steel tail switch controls 3 brightness levels plus UV output with a single hand while a fixed pocket clip secures the flashlight for carry. Rated with an IP68 waterproof rating, the LD02 V2.0 can easily withstand all-weather and is even submersible up to 2m. Powered by a single AAA battery (Ni-MH or alkaline), finding batteries for the LD02 V2.0 is easy wherever you go. With a max runtime of 75 hours, you'll get the most out of each charge. High CRI LED Upgrade -- The Fenix LD02 V2.0 uses an upgraded CREE XQ-E LED with a CRI rating of 90 which means you'll experience a warm, sunlight like beam that renders colors beautifully. With up to 70 lumens of output, that's plenty for reading, inspecting and up close searching. New UV Output -- Use the 200mW ultraviolet LED for identification and currency verification, liquid and oil inspection, scorpion detection and more. Upgraded Stainless Steel Switch -- The durable, stainless steel tail switch provides convenient access to 3 brightness levels plus UV mode. Compact for Everyday Carry -- This AAA flashlight is perfect for EDC with a body weight under an ounce (without battery) and measuring a stout 3.6 inches long. Ready to Go - This LD02 V2.0 package includes everything you need to start using your light directly out of the box. The included AAA battery and LumenTac battery organizer ensures your light is ready to go whenever you are!